Camping is always marching on, always diversifying, always presenting something new. But who would have thought of putting camping and churches together? The Churches Conservation Trust, that’s who. Take a disused church steeped in history. Take friends and families who are always looking for the next adventure, something different, something to feed the soul. Put them together and you have champing. Church camping. A juxtaposed stay as down to earth yet as close to heaven as you’ll ever get. The Champing churches can sleep from 2 to 16 people. The hire of a church is completely exclusive; you won’t be rubbing shoulders with any strangers, apart from maybe the odd spider or two. Child-friendly, dog-friendly, group-friendly, picnic-friendly, alcohol-friendly, the experience is surely one to consider if you’re looking for an authentic, unforgettable mini-break experience. Facilities are basic with camping beds, rugs, cushions and camping chairs supplied but you will have to rely on your own bedding and blankets to keep warm. It isn’t fancy yet there is a certain magic and humour about having the free run of a church for a night or two that makes it seem actually quite spoily. Think of it as a massive tent filled with history. Imagine lying there with the moonlight coming through the stained glass windows, pondering awhile on all the people who have paced the flagstones over hundreds of years. Imagine the kids playing hide and seek in the churchyard and swapping spooky stories by torchlight. That is quite something. And to top the Blytonesque experience, a steaming breakfast butty will be delivered to you by a friendly local in the morning. Sold. Brainchild of Peter Aires, director of the Churches Conservation Trust in the south east, the scheme was piloted in 2014 and launched officially in 2015 with three churches. More than 150 holidaymakers stayed at a champing church that year, including Andrew Flintoff, the former England cricket captain, who documented his overnight stay in Aldwincle on Sky One after England won the Ashes series. In 2016 the trust opened a further four more churches for their champing experience and nearly 700 guests came through their doors. The movement (for it certainly feels like a movement) is increasing to twelve churches in 2017. It is an imaginative way to generate income to maintain these congregation-less churches while offering a new phenomenon in camping. Champing is certainly making the press sit up and take notice. It has been featured in the likes of The Times, The National Geographic, The Telegraph, The Guardian, The Independent and even on national TV. It really feels like there is a wave to catch here. With a new website launched today at www.champing.co.uk and our online booking facility in place to support them, the Churches Conservation Trust is already ramping up the bookings, even from as far afield as America. So, are you going to frequent church anytime soon? We most certainly are. Champing. It’s the one to watch. We met Spencer of Tegology at The Glamping Show this year and were immediately bowled over by his nifty bit of thinking that is set to change how campers think about stoves forever. 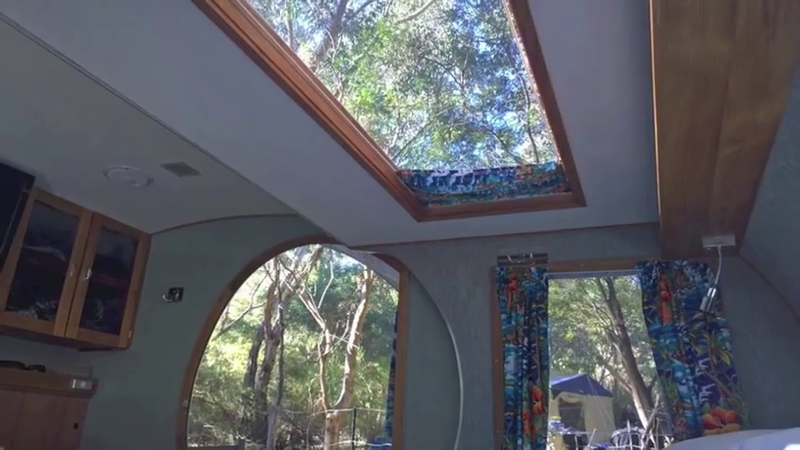 Is it one of the coolest things we’ve seen for a while on the camping scene? Yes. Is it a stove? Yes. Is it a charger? Well, yes. It is so clever. No wonder Peter Jones couldn’t say no when Spencer presented it to him in The Dragon’s Den. The reason the Tegstove is so achingly cool is because it does the things you’ve always wanted one stove to do and more. It is compact, it is extremely stable, it controls the heat over a wider cooking area (no burnt bits in the middle!) and it stores energy so you can use it to charge your mobile devices. It ticks every box plus a box you didn’t even realise was there. Who would’ve thought you could go completely wild camping, cook up a huge pan of chilli without it falling over or burning, and have the facility to remain in touch with the outside world at the same time? Great if you need to quickly post up that pic of the elusive Bigfoot. Or do something serious like catch up with the news or an important email. Or show your friends at home how fabulous you look beside your campfire in your grown-up onesie. You’ll wonder how you ever got by without it. Standard camping stoves will often use a mix of Butane, Propane and Isobutane to create a gas that works in cold climates. This is an unstable and expensive method. Tegstove uses widely available, cost-effective, clean-burning butane gas. Butane is better gas – it comes in lighter cylinders, it can be stored inside, it’s cheaper, less volatile and readily available. However, it gets cold fast and the pressure reduces – but Tegstove has harnessed this to create a greater difference in temperature between the hot and cold plates. The result? A strong controlled flame and stable production of electricity using a Thermoelectric Generator (TEG). Go to the Tegology website and preorder your kit. It will be delivered in April 2017 just in time for the next camping season! Then sit back and wait smugly, knowing just how much this gadget will impress your friends and fellow campers. Congratulations to Spencer and the Tegology team! You’ve made big fans out of us here at Anytime Booking, you’re onto a big winner! Welcome to another innovation in the camping and glamping market, the British-designed Barefoot Caravan. 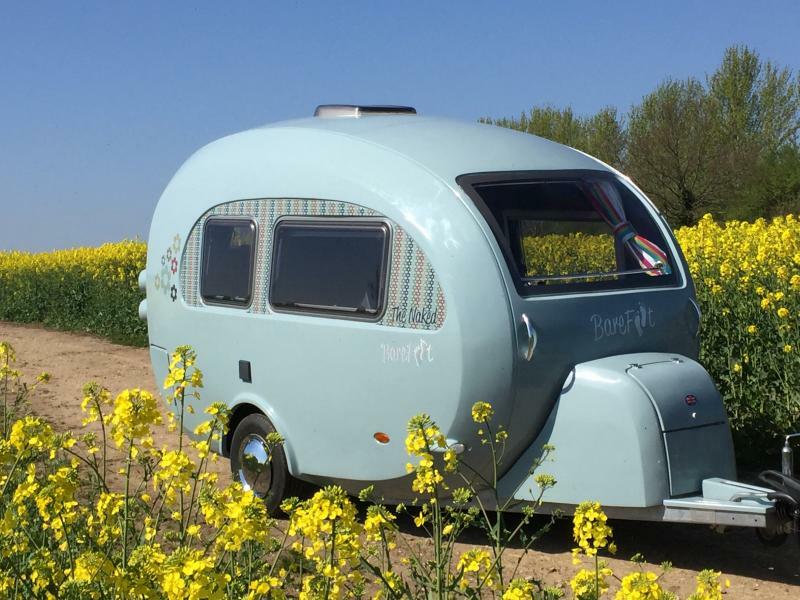 Beautifully curved, retro in feel, yet on the knife-edge of modern, this caravan is built for a couple with wanderlust who want to savour a bit of luxury. Brainchild of Cathy Chamberlain, one of the only female caravan-designers in the world, this wonderful space boasts a modern bathroom, a stylish oak-topped kitchen and a 6ft x 6ft bed, as well as a wardrobe, LED ceiling lights, floor lighting and a gas hob, fridge and freezer. Cathy worked with Ben Matthews and Mike Williams, directors of Blockley-based Watsonian Squire, to build the unique caravan over a three year period. With a price tag of nearly £22,000 to buy one, this little piece of luxury will be a competitive consideration for any couple thinking about owning a caravan. It is also yet further proof that the camping and glamping market continues to pick up a pace, for where there is innovation, there is growth, and where there is growth, there is investment. Happy camping, happy days! The width of a car, low and easy to tow, the Gidget is an awesome piece of freedom-kit. Approaching an incy-wincy bridge? No problem. The Gidget just follows you wherever you go without you worrying about how wide it is, or how heavy it is. Designed by an impressive Australian team, the Gidget takes teardrop camping to the next level with the incorporation of a patented slide-out system that immediately doubles the accommodation space. It has been in the press quite a bit lately, with the unhelpful tagline of ‘cramping’. Really? It’s the opposite of cramping. Cramping is being stuck in a telephone box with a bunch of old aunties. With the Gidget you can go anywhere and pitch under the biggest sky, on the biggest wide-open patch of the great outdoors and breathe in. Just what are you going to do with all that space? Once you slide out the Gidget to its full extension, you have an area of complete relaxation, whether in the sitting or sleeping configuration. With the fab windows and overhead skylight, the outdoors just begs to come in, but with plenty of space for everybody to sit smugly in this inspired little den, that just isn’t a problem. The interior actually houses a queen-sized bed, sheer luxury for most glampers, and the back of the camper flips up to reveal a gorgeous polished timber-clad full kitchen, complete with a two burners, a sink, fridge drawer, pantry and utility drawers. This little teardrop just keeps giving – it also incorporates a fold-up table and a swivelling entertainment console complete with TV, DVD and stereo that can rotate to the outside kitchen area from the indoor living space. Yet the Gidget isn’t designed to be just cool, or cute. It’s also very, very clever. It’s a humming bundle of power with a 110W fixed roof solar power system and deep battery cycle. With an 80 litre freshwater and 40 litre waste tank, a bespoke satellite dish in the design-pipeline and storage in every conceivable nook and cranny, the Gidget certainly has brains. Huge hats off to this Australian team. Small the Gidget may be, but it is absolutely, definitely, perfectly formed. Camping? Glamping? Cramping? The Gidget sits in a category all of its own.